Description: ASP developers need to understand how ASP.NET can help them solve business problems better than any prior product. ASP.NET by Example is designed to provide a "crash course" on ASP.NET and quickly help the reader start using this new technology. 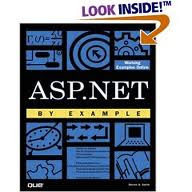 As part of the By Example series, this book approaches ASP.NET in an easy-to-use tutorial way, giving the reader a much faster and more interactive learning experience than the traditional reference book. By building the sample applications taught in the book, readers will learn how to create customASP.NET controls, how to use ADO+ objects in ASP, and how to deploy and manage applications. ASP.NET by Example also provides tools and information needed to migrate old ASP files to the new platform, saving developers significant time and money. As an added feature Steven A. Smith has included multiple case studies on howASP.NET is used in e-commerce applications.